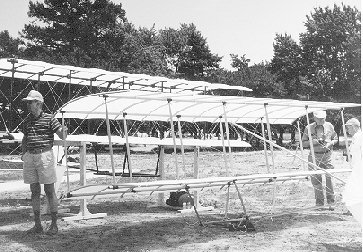 Sixty-three students in Orono, Maine built two copies of the famous biplane glider as an integrated mathematics/science project over the school year. Beginning with drawing plans, the 11 and 12 year old aeronautical technicians then developed balsa and tissue models, and finally, under the guidance of teachers Richard Glueck and Christopher Chilelli, created the full-scale gliders. They flew them as kites on June 7, 1996. The flights were covered by Maine Public Broadcasting, CBS and NBC affiliates, as well as the Bangor Daily News and the Penobscot Times. 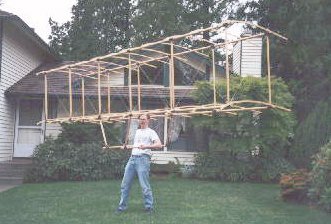 Paul Dees built from original drawings a replica of the Chanute Glider at his home in Redmond, Washington. Paul brought his glider to the Chanute Celebration in Gary, Indiana, displayed it and attempted a test flight on July 27, 1996. The winds were insufficient, but the day before Paul made several successful flights from dunes at Warren Dunes, Michigan, a state park on Lake Michigan. This photo shows Paul with the completed airfoil frame in the course of the construction. Paul's wife Kay was there with a video camera when Paul flew the glider at Warren Dunes, Michigan, several miles east of Miller. Students at the Rochester, New York Institute of Technology built a replica using modern materials as part of an engineering project. 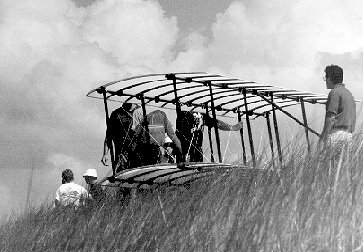 They too brought their glider to the Chanute Centennial Celebration and attempted to fly the glider on July 27, 1996. More pictures of the their glider can be found on the Celebration Page and the 'More Pictures' page.